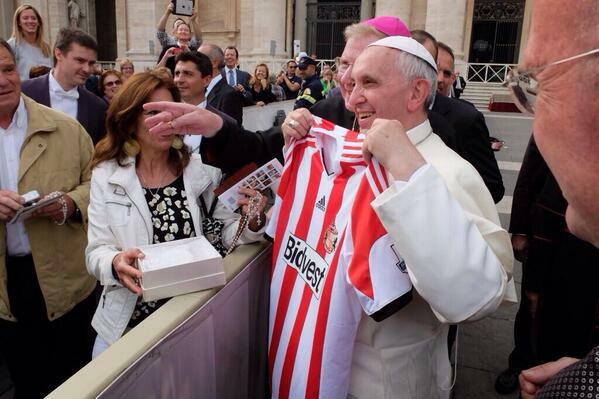 Sunderland fans say they can claim a new devotee after Pope Francis was photographed posing with their club's strip. The photograph was made possible when the club's chaplain Father Marc Lyden-Smith went on a pilgrimage to the Vatican. He carried with him a Sunderland shirt marked with the words 'Papa Francisco' - or Pope Francis - in the hope of being able to present his gift in person. The following day, his Twitter account confirmed that his prayers had been answered and that Pope Francis was the proud new owner of a Sunderland jersey. Father Marc said afterwards that he was "very lucky to get the chance to meet him" since there was 120,000 other people hoping to do so. He confirmed that the Pontiff had taken the shirt back into St. Peter's Basilica with him, and that he had promised to pray for the club.